If someone mentions the Rock and Roll Hall of Fame, what is the first name that pops into your head: Elvis Presley? the Beatles? Chuck Berry? ABBA? OK, not ABBA — and probably not Doc Pomus, either. My guess is that there are a lot of devoted rock fans who have never heard of Doc Pomus. He’s not exactly famous, but he is in the Rock and Roll Hall of Fame, having been inducted in 1992 along with The Isley Brothers, Johnny Cash, The Yardbirds and The Jimi Hendrix Experience, among others. So who was Doc Pomus? He was actually named Jerome Felder; he adopted the pseudonym when he was trying to become a rhythm-and-blues singer, and thought Doc Pomus sounded more authentic. His career as a performer never took off, perhaps partly for a reason we’ll get to shortly. He did, however, find success as a songwriter. Collaborating with composer Mort Shuman, he wrote hits for Elvis (“Marie’s the Name of His Latest Flame”, “Surrender”, “Little Sister”, “Viva Las Vegas”). Unless you’re currently on Social Security, you may not remember other songs they wrote, like “A Teenager in Love” (Dion and the Belmonts), “Hushabye” (the Mystics), or “Can’t Get Used to Losing You” (Andy Williams). The best-known songs by Doc Pomus were performed by The Drifters, though, and one in particular has been recorded by many other artists in the decades since it was a number-one hit in 1960. 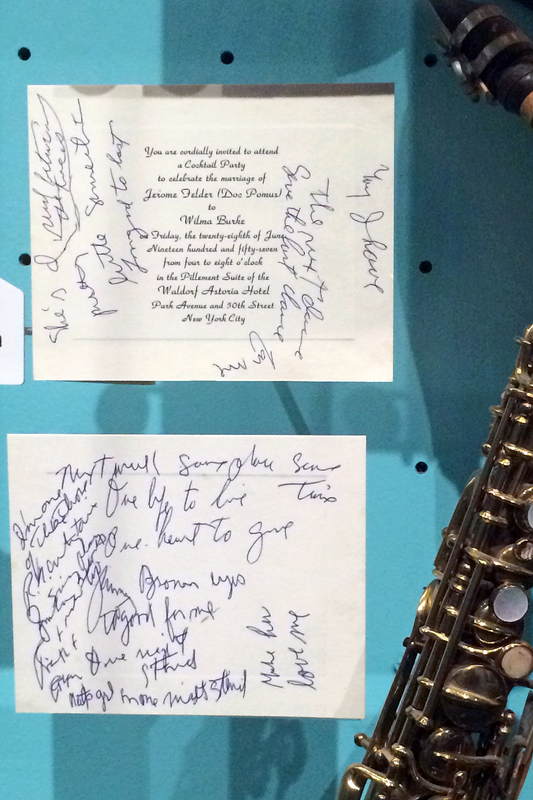 There are different versions of the story about how “Save the Last Dance for Me” came to be written, but the Rock and Roll Hall of Fame in Cleveland has evidence that Pomus jotted down some preliminary ideas for lyrics on the printed invitation to his wedding reception (see photo). One account has him making those notes while at the party, but that seems unlikely for several reasons, not least of which is the three-year gap between the wedding reception and the release of the record. Other sources state that he came across the invitation while going through some old stuff in a hatbox, and that finding the invitation triggered a bittersweet memory of that night years earlier, causing him to jot down some phrases on it. In any event, this fact isn’t in dispute: As a child, Jerome Felder had contracted polio. He couldn’t walk without the aid of crutches, let alone dance. His bride was a Broadway actress and dancer named Willi Burke. You can dance/Every dance with the guy/Who gave you the eye/Let him hold you tight. You can smile/Every smile for the man who held your hand/’Neath the pale moonlight. But don’t forget who’s taking you home/And in whose arms you’re gonna be/ So darlin’/Save the last dance for me. By the way, the invitation with those lyric fragments scrawled on it is just one of thousands of keepsakes in the Rock and Roll Hall of Fame Museum. It’s sort of like exploring the contents of your grandmother’s attic, if Grandma was best friends with Mick Jagger, the Beach Boys, Aretha Franklin, Michael Jackson… and Doc Pomus, too.